As we all are aware of a fact that, Android smartphones are dominated the mobile market all over the world. These Android OS-based devices sold like cupcakes, pizzas, and burgers etc. Millions of people aren't leaving their home without taking their Android phones. People buying mobile not just for calling, but also for texting, WhatsApp & for listening to songs all over the day. It helps them in relaxation, diverting their thoughts, setting up their minds or moods and so many reasons. But don't know why the music app gets stopped and the mood gets changed. Check the reasons and solution to fix the stopping of the music app. The Android OS is at the top of best mobile operating systems having lots of features, but its framework itself sometimes fails to serve users requirements, especially talking about MUSIC APP. So some of you people are now facing a common Android problem with the music player app like "Unfortunately Music has stopped". It sometimes very disappointing thing when music player gets stopped and the message keeps popping up on the mobile screen. 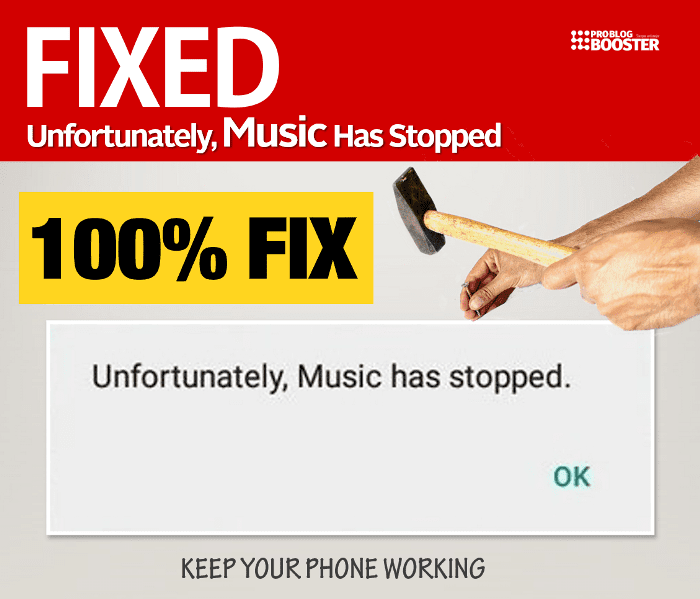 No worries, you have now reached on the final destination and in this page, I'll talk about how anyone can solve this "Unfortunately Music has stopped" error quickly. [SOLVED] "Unfortunately Music Has Stopped"
5 Reasons, why "Unfortunately Music has stopped" occurs? These are a few possible reasons behind your Android device throwing such an error message while you try to use Music Player.